Jeffrey Gural, a member of The Cooper Union's Board of Trustees since 2003, has pledged one million dollars to the institution's endangered Saturday Program. The donation rescues the program, which offers a free arts education to New York City public high school students, from an uncertain future. "It means that we are here. We are not in a panic," Marina Gutierrez (A'81), Director of the Saturday Program says. "I didn't even know the program existed," Jeffrey Gural, at left, admits in his matter-of-fact style. He recently heard about the Saturday Program from fellow Trustee Richard Lincer who had just pledged a $15,000 matching gift to the program after visiting its annual exhibition and hearing of its budgetary woes. "I met with Marina Gutierrez and Victoria Febrer [Administrative Coordinator] of the program and was impressed," Mr. Gural says. "I told them I would donate a million dollars at the rate of $100,000 per year in order to allow them to continue to thrive and restore some of the cuts they had to make." The donation requires that The Cooper Union continue to fund the program at its current rate, according to Mr. Gural. "I really did it to try and keep that program going and to try and improve on it." 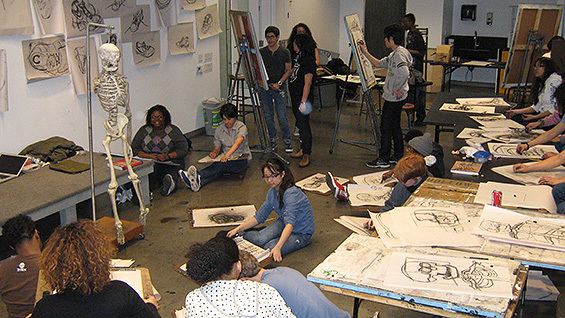 The Saturday Program, started in 1968 by Cooper Union students, provides free art classes, including supplies, to over two hundred local NYC public high school students per year. 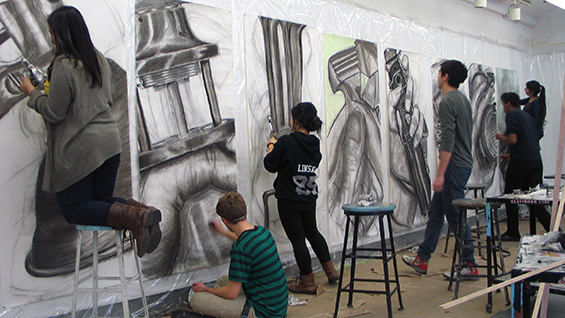 Classes, which meet every Saturday, continue to be taught by undergraduate students from the Schools of Art and Architecture under the supervision of a professional staff of artists. Originally inspired by the slashing of public school arts programs, the Saturday Program itself recently saw its own budget reduced as part of institution-wide belt tightening. For the first time ever, according to Director Gutierrez, they had to begin soliciting donations from individuals. Does Mr. Gural, Chairman of Newmark Knight Frank, a commercial and industrial real estate management firm, have a particular interest in the arts? "Not really," he says. "But I think people who do and may not have the money to go to a school should have an opportunity to pursue their dream in the arts. And maybe as a result they can get a scholarship to Cooper Union or some other school. I sponsor several I Have a Dream programs, which helps kids get a college education. It is a personal project of mine to level the playing field. And I felt that with all the controversy around the decision to end free tuition at The Cooper Union it was important for me to make the statement to the community that this program is free and that we are committed to maintaining this program and actually improve on it."